Though he failed to card a single birdie on Thursday, Mickelson dropped 9 birdies and an eagle on Saturday. The dominant golfer this year was Tiger Woods. No question about that. Sure, he had an oh-fer at Augusta, Merion, Muirfield and Oak Hill. Still, five wins, with one of them at Arnold’s place, another at the Stadium course and another at Firestone, where he won by seven? Not too shabby. But Woods is not Golf Magazine’s Player of the Year. We’re going beyond shots played, money won, trophies hoisted. We’re rewarding emotional impact, and even our modern parse-it-to-death culture hasn’t figured out a way to measure that. When an Oscar voter checks off a box for Best Picture, is he or she making a study of ticket sales and a technical analysis of Denzel Washington’s ability to cry on command? No. That vote is more instinctive than anything. What film moved me the most? We’re doing pretty much the same thing here. check to UNICEF, he’d be a leading contender for another magazine cover, as Sports Illustrated’s Sportsman of the Year. Park’s year has been woefully underappreciated, in keeping with a lousy tradition of underappreciating women’s golf. And yet, when we take stock of the golf year for the purposes of this honor, she doesn’t stand on the highest podium. For whatever reason, her hat trick and her genial personality didn’t make us stop in our tracks. She almost made it look too easy. We kicked other tires. Adam Scott, Justin Rose, Stacy Lewis, Lydia Ko, Matt Fitzpatrick, Bernhard Langer. All of them had remarkable years. You could make a case for any of them, and some of you surely will. You’ll cite statistics, wins, money titles. You’ll cite your positive encounters on autograph lines and at airport check-in kiosks. But we’re going with the golfer who moved us the most, who had the most memorable year, the golfer with whom we would have most wanted to trade places in 2013. And that’s how we landed on Lefty. Phil Mickelson has been making our lives more interesting for years. His 2013 was crazily interesting, for us and for him. Congratulations, Philip Alfred Mickelson. You are our Golf Magazine Player of the Year for 2013. And no, you cannot regift it. We say that because we know you might argue that this title should go to Tiger. Or Inbee. Or Kid Matt, the teenager from England who won the childhood title that is so dear to you, the U.S. Amateur. Somebody other than yourself. Your modesty is winning. But we have the final say. Months later, we still feel good about the man’s decision to fly 2,500 miles on the eve (and morning) of the U.S. Open so he could attend his daughter’s middle-school graduation. We liked the way he quickly rescinded his January complaint about the California tax code after remembering that being required to pay millions in taxes is actually a nice problem to have. We noted with gratitude how he continues to honor veterans, promote science education and further the game’s tradition of graciousness. He was, this 43-year-old Phil Mickelson, still quite a figure cutting across your flatscreen, wasn’t he? The heavy-footed, toes-out walk, his hippie-hair spilling out from under his corporatey, old-school visor. Phil has always been such a delightful contradiction. The dimply smile, almost bashful, when he drains a snake. The alligator-skin shoes -- more expensive than the new transmission we’re saving up for. You’ll never pin this man down. The genius of Phil -- the ultimate root of his popularity -- is that win or lose, he’s wildly entertaining. He’s an original. He figured out a way to turn an individual sport into a team sport: the caddie, the wife, the kids, the parents and sibs, the teachers, even the agent and the PR guy. Most players use the whole entourage thing to keep us at bay. In Phil’s case, they’re emissaries. Mickelson won this award on the basis of what he did over three consecutive tournaments at the height of the season. We’re talking about three weeks in June and July, when baseball was humming along and football was napping and golf was front and center, more so than usual, courtesy of Phil. What he did in those 12 rounds will have a long life in the annals of the game. The meltdown at Merion was a fascination, even if you felt bad about rubbernecking. It was there that Phil finished second in a U.S. Open for a record sixth time. Astounding. Some players might have been done for the rest of his year after giving that one away. Some players might have shut the book on their careers. Such is the hold of the U.S. Open on an American golfer. But then Phil won his next time out, at the Scottish Open in July, at Castle Stuart. It was so improbable. To win there, he had to make the shots, of course. But first he needed to win the mind game. If he can ever put into words what he did in that turnaround, those veranda chitchats at his KPMG golf outings will go way beyond golf. The Scottish Open week was the preamble for the Open itself, the oldest and grandest championship in all of golf. And this year it was especially grand, as it always is at Muirfield, the epicenter of golf civilization. For Phil, the Open (we super-experts all said) was the major he would never win. Not with his towering ball flight, his putting stroke built for speed, his impatience in the face of better-hit-a-provo rough. You know how this Muirfield story ends. All through the back-nine 32 that Phil shot, on a gloomy, cool, windy Sunday, he was Hogan, Nicklaus, Watson, Woods. He was Youngest Tom Morris. The shots he played were ridiculously solid. He didn’t miss. There was no flashback to Merion. Five back when his head hit the pillow on Saturday night, he won going away, by four shots. It’s not that he erased that Merion wound. Golf doesn’t work that way. What he did was rise above it, just as he has done with his arthritis, with his wife’s breast cancer, with his long wait for his first major, with the months and years his putting stroke went AWOL. How inspiring. Golf lends itself to storytelling. In 2013, Phil Mickelson provided us with a story the likes of which we don’t often see. It’s a story you can tell a friend without having to google a single thing. The Book of Phil, 2013, has nothing to do with missed fairways or FedEx points or funky rulings. His story this year was as simple as the game itself. Try. Fail. Regroup. Try again. You had to see it to believe it. We saw it. A 43-year-old playing like a boy and a man. It was awesome, better than anything else in a year that offered something for everyone. We’re thrilled to remember that story, and to honor its author. 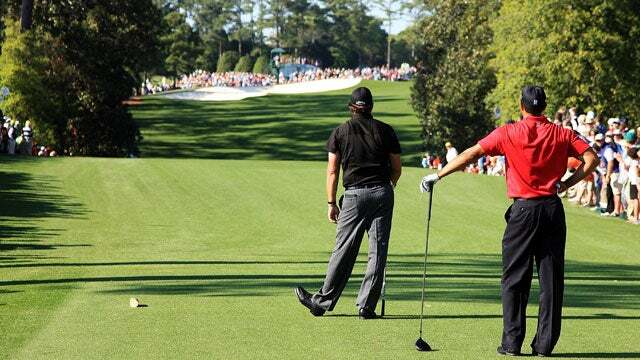 More Phil: The 100 Greatest Phil Mickelson Photos | What Makes Phil Tick? | Bones on Phil's Best Shots of 2013 | Gary Player on POY: It's Phil, Barely | Phil's 5 All-New Scoring Secrets | Phil Phanatics: The People Behind the People's Champion | Phil's Phrankenwood: It's Alive!